Outside the Ball begins Love Week with Kevin Anderson. The tennis star joined our host Mayleen Ramey to share the key to a successful marriage. “From her side it’s just the amount of support and understanding she’s given me has been really amazing, and that was right from when I met her. 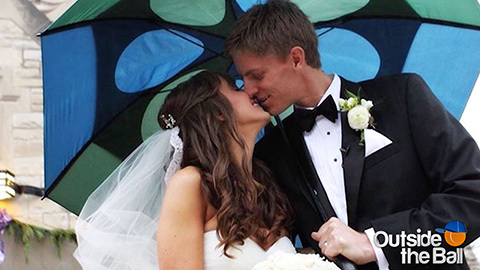 She’s really allowed me to pursue my goals!” Kevin explained about his 7 year marriage to Kelsey Anderson. Kevin and Kelsey met in collage in 2005, where they shared a common bond as collage athletes. Kevin in tennis and Kelsey in golf. “Just like anything, I think we’re still learning. It’s great we’re able to share these experience together, but I think being able to talk and communicate that is always, I think a key. No one has really asked me that! It’s something that means a lot to me both from a professional and personal stand point,” Anderson continued. Kevin and Kelsey Anderson are the definition of couple goals and we wish them a Happy Valentine’s Day!